ACA and UNICA are organising a joint stakeholder event at the European Committee of the Regions in Brussels on behalf of their project teams – GREET and Academic Refuge. 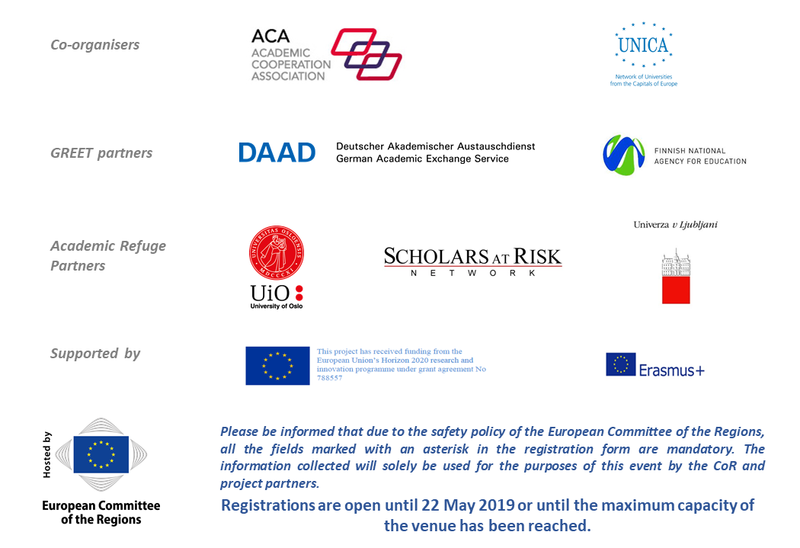 The event, titled Higher Education Values in Practice - Integration of highly skilled refugees and at-risk academics in Europe, will focus on academic values and the role of Europe’s higher education community in supporting students and scholars with refugee background and academics at risk. The partners in the two projects have for years supported these vulnerable groups in various ways – from providing individual grants and placements for academics at risk, academics with refugee background, to national-level support frameworks for higher education institutions to support refugee students in their academic paths. Guiding Refugees via European Exchange and Training (GREET) is a Horizon 2020 Science4Refugees project which aims to contribute to the integration of highly skilled refugees in European higher education through mutual learning and exchange of good practices among national support structures and higher education institutions (HEIs) in 9 European countries (Austria, Belgium/Flanders, Germany, Greece, Finland, France, Norway, Sweden and the UK). By scaling up successful practices in Germany and Finland by means of a peer learning activity (PLA) and disseminating its results through EU-level webinars, the project enables debates at European level on current practices and obstacles for their implementation, search for joint solutions and improvements for a better and more effective integration of highly skilled refugees residing in the participating countries. The results of the project (PLA, webinars, stakeholder event) will be systematised and stored in the online compendium – a repository of existing policies and practices available to the wider higher education community. The online compendium will be launched in September 2019. The EU-funded (Erasmus+) ‘Academic Refuge’ project aims to improve the capacity of European universities to assist refugees and threatened academics on campus and to promote understanding and respect for higher education values. The two overlapping project objectives are 1) to improve the capacity of European universities to assist refugees and threatened academics; 2) to promote greater respect for academic freedom and greater protection for higher education values.This project raises greater awareness of the importance of academic freedom to a healthy higher education sector, the consequences for society at large when such freedom is repressed, and the steps we can take as a sector to protect higher education values.